As cryptocurrencies go mainstream, the challenges that have kept them from reaching their true potential as a currency-for-all still exist. Chief among these is the slow and expensive processing of transactions. While some altcoins on the market, such as Ether, have demonstrated better transaction speeds than Bitcoin, even the fastest have run into serious bottlenecks. As serial entrepreneur, marketing expert, and Blockchain evangelist Ameer Rosic explains: “Ether can only do 7 transactions per second.” According to Rosic, this is still too slow to consider cryptocurrencies as a mainstream payment method. Along with speed constraints, transaction costs have also grown prohibitively, in times of network congestion. On a recent day of trading, the average fee to process a Bitcoin payment in ten minutes was roughly $14. These fees make microtransactions impractical and limit cryptocurrencies’ growth as a vehicle for receiving payments for small businesses and retailers. Fixing this bottleneck on transaction speed and cost has become a major focus among the community of miners, programmers, and investors who believe cryptocurrencies are the future of finance. Bitcoin and a number of other cryptocurrencies are based on blockchain technology, that uses a decentralized model to create a financial system without the regulation of banks. However, decentralization is at the heart of the transaction speed problems that cryptocurrencies are facing. Decentralized blockchains mean that each fully-functioning computer node on the network must process every transaction. In the case of Bitcoin, there are approximately 200,000 computers participating in the network and they all must validate and store every transaction. Consequently, Bitcoin has become a victim of its own success. As it becomes more popular and adds users and nodes, transaction processing times become even slower. The blockchain grows which leads each fully participating node in the network to demand even more storage, bandwidth, and computing power. In addition to the technical problems associated with decentralization, transaction speed can also be limited by the protocols that govern each cryptocurrency. These include limits on the size of each block in the blockchain and, by extension, on the number of transactions that can fit on each block. Fortunately, for the future scalability of cryptocurrencies, dozens of entrepreneurs and companies are hard at work developing solutions to these technical problems. Segwit – SegWit (short for Segregated Witness) has tackled one of the technical limitations head-on. SegWit modified the rules of the transaction format used in the Bitcoin blockchain and increased the block size limit. SegWit strips off the signature from the public address of the sender in a transaction, moving it to a structure towards the end of the transaction. For more on Segwit, check out this guide. Dash’s Masternodes – Dash has become known as one of the fastest cryptocurrencies in terms of transaction speeds by establishing a two-tiered system which involves miners and masternodes. Miners verify transactions across the network and create new blocks on the blockchain, while masternodes perform certain functions such as InstantSend which allows users to have their transactions verified instantly. This is done via the masternodes locking in specifications for a transaction so that it can be verified almost instantaneously, without it having to be verified by miners. 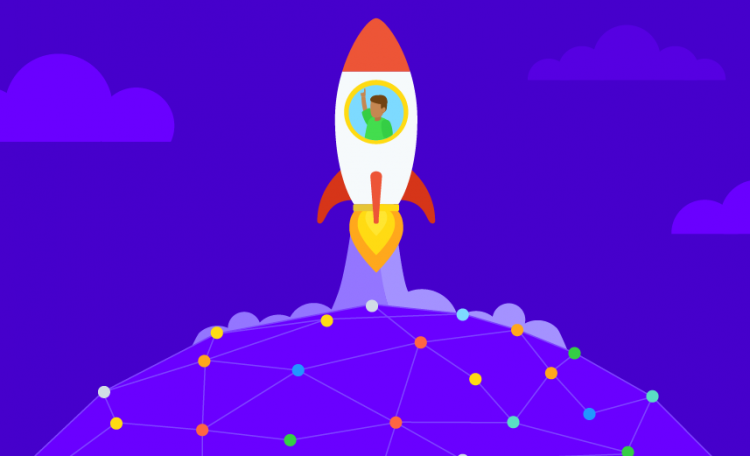 Microsoft’s Coco Framework – Microsoft is investing heavily in the development of technology that can make blockchain-based systems much faster than they are now. The Coco Framework is Microsoft’s open source approach to ledger construction, giving blockchain networks scalability by leveraging the power of existing blockchain protocols and trusted execution environments (TEEs), such as Intel SGX and Windows Virtual Secure Mode (VSM). The Cosmos Network – The Cosmos Network is composed of multiple parallel blockchains, called zones, each powered by Byzantine fault-tolerant (BFT) consensus protocols. These zones can handle up to thousands of transactions per second. Will the Lightning Network Improve Transaction Speeds Dramatically? Of all the scaling solutions currently in development, the most exciting might just be The Lightning Network. For the past three-and-a-half years, The Lightning Network has been developed by independent groups of programmers from all over the world. The main idea of the Lightning Network is that many payments (especially smaller ones) do not need to be recorded in bitcoin’s ledger directly at the time of transaction. The Lightning Network intends to move the majority of ordinary bitcoin payments to private channels between individual users while relying on the blockchain to maintain security and honesty if disputes arise. Here’s how the Lightning Network works. Two parties can open a private transaction channel, which is communicated to the blockchain and incurs the normal transaction fee. This channel can stay open for a preset length of time agreed upon by the parties. During that time, the parties can complete as many transactions as they like, without any additional processing delays or fees. When the period ends, the channel closes and sends the final tally of the channel’s transactions to the blockchain. One of the most exciting aspects of the cryptocurrency marketplace is that it’s always changing at such a rapid pace. Even what’s considered new in blockchain, isn’t new at all. “The Lightning Network took years to develop. That’s not new,” says Rosic. For Rosic and other entrepreneurs, keeping a close eye as the blockchain technology matures is imperative. After all, the whole identity of cryptocurrency is that transactions are not one-size-fits-all. With the creation of new blockchains, cryptos, and innovative developers, a revolution in cryptocurrency technology is on the way.